WARNING: Do not operate the engine with the hood open until the fan blade has been first examined for possible cracks and separation. 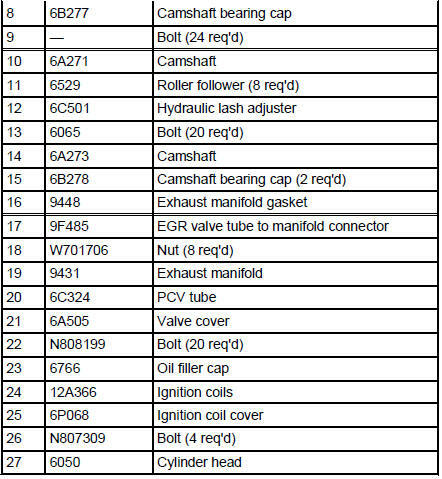 Always refer to these labels when replacement parts are necessary or when checking engine calibrations. The engine parts often differ within a CID family. 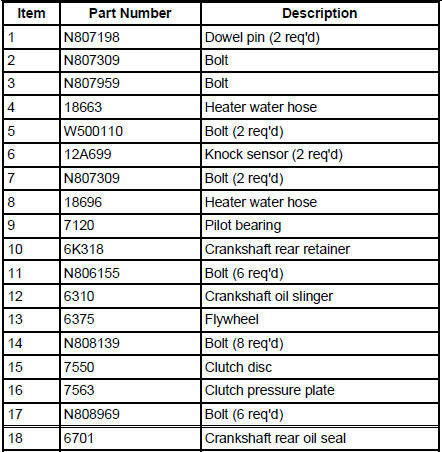 Verification of the identification codes will ensure that the correct parts are obtained. 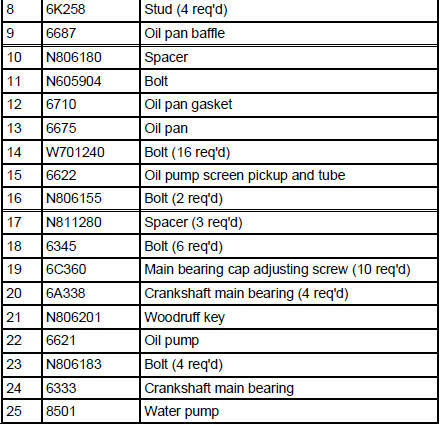 These codes contain all the pertinent information relating to the dates, optional equipment and revisions. 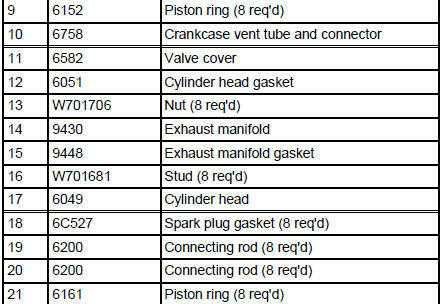 The Ford Master Parts Catalog contains a complete listing of the codes and their application. 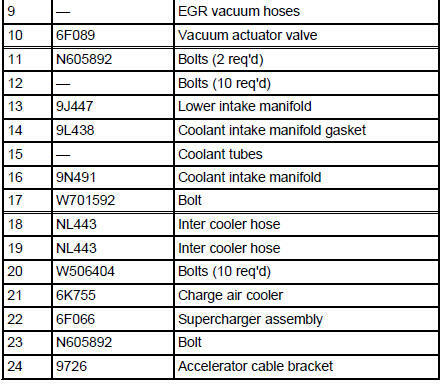 Operation and necessary maintenance of the exhaust emission control devices used on this engine is covered in the Powertrain Control/Emissions Diagnosis (PC/ED) manual. are mounted in the lower intake manifold. meter fuel into the air intake stream in accordance with engine demand. are positioned so that their tips direct fuel just ahead of the engine intake valves. 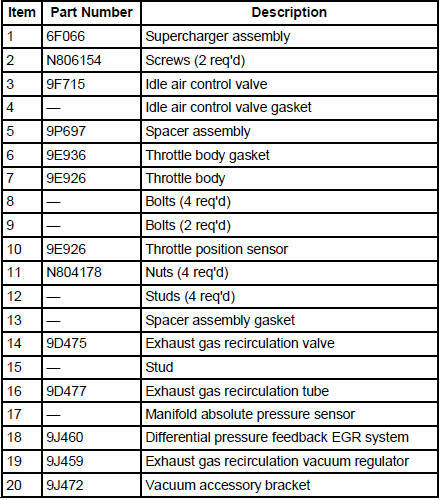 are connected in series with the fuel pressure sensor. supply fuel from the fuel tank with a fuel pump mounted in the fuel tank. is positioned upstream from the fuel injectors on the fuel injection supply manifold. ball-tip hydraulic lash adjusters provide automatic lash adjustment. roller followers ride on the camshaft lobes, transferring the up-and-down motion of the camshafts to the valves in the cylinder heads. All engines are equipped with a closed-type positive crankcase ventilation system recycling the crankcase vapors to the upper intake manifold. oil is drawn into the oil pump through the oil pump screen cover and tube in the sump of the oil pan. oil is pumped through the oil bypass filter on the left front side of the cylinder block. oil enters the main oil gallery where it is distributed to the crankshaft main journals and to both cylinder heads. From the main journals, the oil is routed through cross-drilled passages in the crankshaft to lubricate the connecting rod bearings. Controlled leakage through the crankshaft main bearings and connecting rod bearings is slung radially outward to cool and lubricate the cylinder walls as well as the entire connecting rod, piston and piston rings assembly. The left cylinder head is fed from a drilling into the supply passage feeding the main gallery at the front of the cylinder block. The right cylinder head is fed from a drilling into the rear of the main gallery. Main gallery pressure is reduced as it enters the cylinder head galleries through fixed serviceable orifices located at the upper part of the feed passages. It is this reduced pressure in the cylinder head galleries which feeds the camshaft journals, the hydraulic lash adjusters and the primary and secondary timing chain tensioners. The camshaft lobe and roller followers are lubricated by splash created through valve train operation. The lubrication system of the 4.6L (4V) engine is designed to provide optimum oil flow to critical components of the engine through its entire operating range. The heart of the system is a positive displacement internal gear oil pump using top seal rotors. Generically this design is known as a gerotor pump, which operates as follows. The oil pump is mounted on the front face of the cylinder block. The inner rotor is piloted on the crankshaft post and is driven through flats on the crankshaft. System pressure is limited by an integral, internally-vented relief valve which directs the bypassed oil back to the inlet side of the oil pump. Oil pump displacement has been selected to provide adequate volume to ensure correct oil pressure both at hot idle and maximum speed. The relief valve calibration protects the system from excessive pressure during high viscosity conditions. The relief valve is designed to provide adequate connecting rod bearing lubrication under hightemperature and high-speed conditions. The 4.6L (4V) DOHC engine is equipped with a serpentine drive belt. To ensure maximum life, a replacement drive belt should be of the same type as originally installed. The accessories mounted on the front of the engine are belt-driven by the crankshaft. The serpentine drive belt is routed over each accessory pulley, driven by the crankshaft pulley bolted to the crankshaft. For service procedures, including tensioning. Refer to Section for basic mechanical concerns or refer to the Powertrain Control/Emissions Diagnosis (PC/ED) manual for driveability concerns.